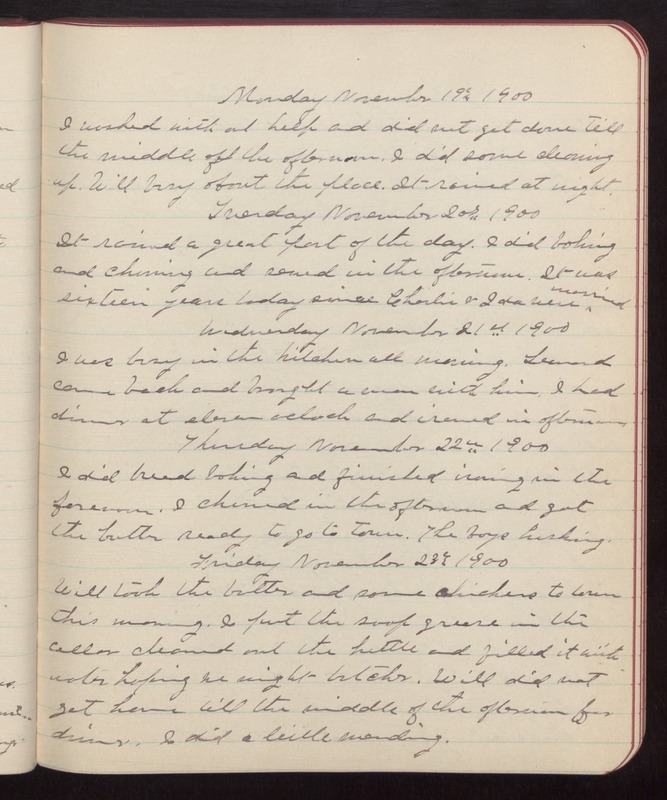 Monday November 19th 1900 I worked with out help and did not get done till the middle of the afternoon. I did some cleaning up. Will busy about the place. It rained at night. Tuesday November 20th 1900 It rained a great part of the day. I did baking and churning and sewed in the afternoon. It was sixteen years today since Charlie & Ida were married Wednesday November 21st 1900 I was busy in the kitchen all morning. Leonard came back and brought a man with him. I had dinner at eleven oclock and ironed in afternoon Thursday November 22nd 1900 I did bread baking and finished ironing in the forenoon. I churned in the afternoon and got the butter ready to go to town. The boys husking. Friday November 23rd 1900 Will took the butter and some chickens to town this morning. I put the soup grease in the cellar cleaned out the kettle and filled it with water hoping we might butcher. Will did not get home till the middle of the afternoon for dinner. I did a little mending.